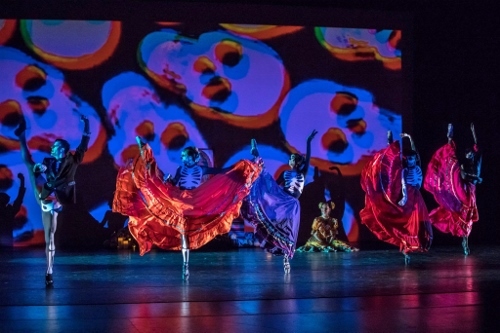 Graham Lustig, Artistic Director of the Oakland Ballet Company, has developed an enthusiastic audience with his production of “Luna Mexicana.” To supplement his own ballet of the same name, he also invited various local groups on November 3 to Oakland's Paramount Theatre to celebrate “Dia de los Muertos” (the Day of the Dead). Included in the program was “Nahui Ehecatl” a blessing ceremony dedicated to Mother Earth, Ballet Folklórico México Danza, and the Mariachi Mexicanisimo, an instrumental and singing group. There was one outstanding dance event: Ramona Kelley danced José Limón’s “Chaconne,” expertly played by violinist Terrie Baune. The Blessing Ceremony was truly evocative of ritual, dancers and drummers dressed in gorgeous costumes and honored the four elements that gives us life. It would have been even more satisfactory had the blessing words been heard over the lively drumbeats and chants. 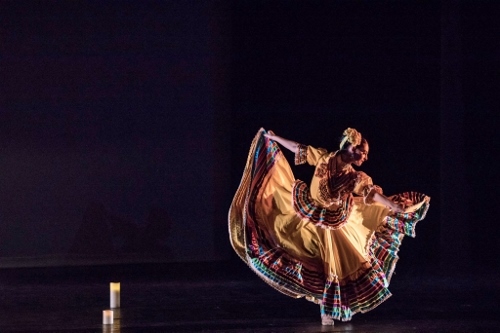 Ballet Folklórico México Danza celebrated Ballet Folklórico de México founder/choreographer Amalia Hernandez’s 100th Birthday with the "Revolution suite," remembering the men, women and children who fought in 1910 for freedom and equality. With nine parts of the story, we witnessed lovers, devils, a death figure and all those who participated “in the eternal dance of life.” It was a lively event, truly a celebration. Lustig’s “Luna Mexicana” was a ceremony that summoned the dead to celebrate with the living. Ramona Kelley again portrayed Luna, who, in a worship ceremony, recalls the dead ancestors. They appeared as skeletons and other eerie forms, dancing a duet as a bride and groom, a deer solo, a quintet, and the famous “Hat Dance.” It was a beautifully executed event, although a bit overshadowed by all that came before. The “Chaconne” deserves special mention. Kelley has mastered the gestures that the Mexican dancer Limón styled for this Bach piece. Her hands encircling her head, her stretched legs, her fall and rise from the floor all captured Limón's style and the elegance of the dance. Alas, in the midst of all the bright costuming and celebration, her simple black costumed figure though brilliant, almost disappeared. For this reviewer the Mariachi Mexicanisimo group could have cut its program by half. The material presented was more appropriate for a night club event, not an evening of dance/theater. Each number was a treat, but there were too many and it was too much. Congratulation to Lustig, all the dancers and groups and guests for an enthusiastic celebration. 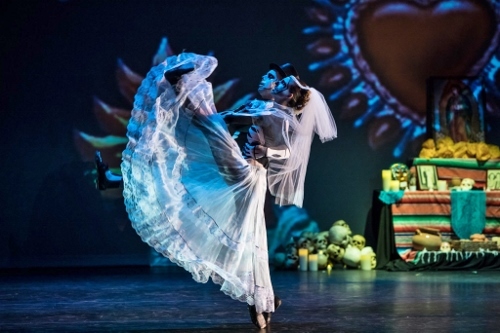 Oakland Ballet Company in Graham Lustig's "Luna Mexicana." Oakland Ballet Company's Ramona Kelley in Graham Lustig's "Luna Mexicana." 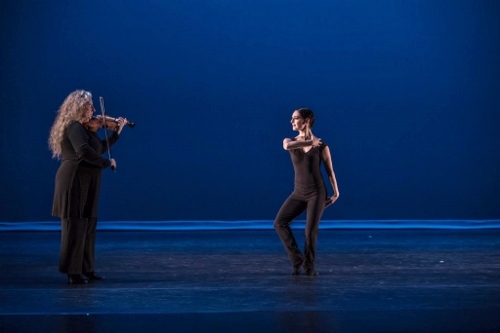 Terri Baune, violin and Ramona Kelley in José Limón's "Chaconne."